For exact phrase matching use quotation marks (e.g. "speed controller"). 420 results found containing all search terms. 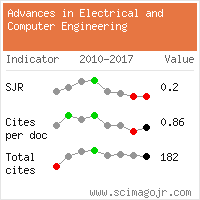 The search engine database includes all papers published after 2007, including titles, author names, abstracts, keywords, full papers text, references and citations. For papers published between 2001 and 2006, please visit the Archive section. Website conception, design and maintenance by Eugen COCA. Content updated on 28 Feb 2019. Site engine updated on 28 Feb 2019. This page was generated on the server in 1.053 seconds and loaded in your browser in > seconds.